My friend who is a long time Squat/IG player has been working on a genestealer-based Tyranid army, when GW dropped the Genestealer Cult codex. He picked up the codex last week and pulled together a force based on a mix of his IG and Nids and this weekend we took advantage of a kid-free weekend to throw down some dice against my Wolves. 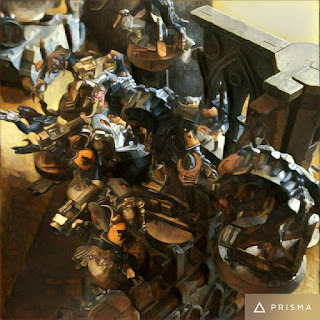 I took the Ironwolves formation from the Curse of the Wulfen book - its the only Greatpack I have the figures to field. The bonus weapons & wargear for vehicles are nice as is the ability to disembark out of a vehicle having moved 12 inches. The Cult won the roll-off to deploy first and infiltrated or reserved pretty much everything. In return the wolves cautiously castled up. The Long Fangs took up station on the first floor of a ruin, safe from burrowing mawlocs. The Landraider took up position on the Western flank, whilst the Grey Hunters, Blood Claws 1 were ready on the Eastern flank. The Landspeeder started near Objective 6, the empty Razorback near Objective 1, and Blood Claws 2 acted as a rear guard for the Long Fangs near Objective 2. Very little happened as the Lictors hugged cover wherever possible waiting for the foolish imperials to blunder into their trap. Night fighting was in effect, and no targets were visible. My Landraider and Grey Hunters moved forward cautiously - an evil, long buried smell drifted on the winds but in the the eddying breezes the wolves couldn't get a clear direction on what was approaching. And everything arrives from reserves barring a single mucoloid spore! To the east, approaching from out of the dawn's light rumbled the armoured Neophyte Cavalcade. In the south, the Blood Claws 2 rhino was rocked by repeated blows from beneath as both mawlocs targetted the vehicle and wrecked it, forcing the young marines out. At which point the ground seethed with armoured chitin as the First Curse erupted from the ground (Cult Ambush) thanks to the Patriarch's warlord trait (Ambush Leader) and a horrifying number of genestealers charged the Blood Claws and Razorback. The Razorback was wrecked, but the Blood Claw pack leader and another marine surived, locking the Genestealers and the Patriarch in combat. What a turn - two vehicles destroyed (First Blood) and a unit all but gone in seconds. Look at the horde of genestealers! As the rosy fingers of dawn crept over the horizon, the extent of the ambush became clear. The Long Fang squad leader impassively ignored the screams and bolt pistol fire behind him and ordered his band of brothers to crack open one of the Cult chimeras, spilling the deformed mutants into the open. The Wolf Lord took advantage of the opening the ancient had given him, and the land raider moved slowly to the east and brought down the armoured sentinel with its assault cannon. With a scream the Stormfang dropped from the sky over the eastern flank and brought its heavy armament to bear on the cultists, wiping them out. The flyer's machine spirit noticed the presence of the heavily armoured Leman Russ and tasked the starboard multi-melta to destroy the hulk. Its explosion stripped a hull point from the scout sentinel. The Neophytes grossly underestimated the Wolves' firepower. ​The wolves' counter attack had neutralised the neophytes - with the space this gave them, the landspeeder and grey hunters moved flat out into Objectives 4 and 5. Surounded by the smoking remains of the Cavalcade, the remaining chimera backed up frantically out of meltagun range. The scout sentinel sidled south to Objective 1 and tried to look inconspicuous. In the north, DeathLeaper and a lictor moved up to threaten the Grey Hunters whilst another lictor moved towards the landspeeder. Mawlocs summoned by the foul beasts pheromone trail burrow up, one glancing the rhino and the second doing no damage to the landspeeder before being destroyed by the deepstrike mishap. The Genestealers finish the Blood Claws off and consolidate into the ruins under the Long Fangs. Deathleaper's choice: a Landraider full of Terminators, or a Rhino with half a dozen grey hunters? Easy decision. The Grey Hunter's rhino is destroyed by a lictor's assault, spilling the marines into the open for Death Leaper's assault, killing two of them. The lictor assaulting the landspeeder whiffs his attack after scrambling up the cliff. The Stormfang continues north, with the lictors in its sights. The Landspeeder moves into the open, but fails to kill the lictor with its multi melta, assault cannon and two krak missles. The Landraider moves slowly east, popping the remaining chimera with its multi melta, and destroying a mucolid spore blocking its way. The Long Fangs release a volley of frag missiles into the mass of genestealers but only kill 4. The Stormfang vaporises the lictor that wrecked the grey hunter's Rhino, and pots the lictor who tried to assault the landspeeder with its multi-melta. The Grey Hunters cause a wound on Death Leaper, losing another marine in return and Death Leaper hit and runs out of the combat. The remaining mawloc erupts under the grey hunters, swallowing them whole. Death Leaper moves to assault the landspeeder, but wrecks it with his flesh hooks first, leaving himself stranded in the open. The Genestealers swarm up the ruin, engulfing the Long Fangs. Unnoticed, the Patriarch separates from the First Curse, and moves off the board and into the shadows. The neophytes huddle near the wreck of their Chimera, too close to the Blood Claws' Rhino to likewise leave the board. The Landraider revs its engines and speeds north to disgorge the Wolf Lord and his retinue - the Lord separates and targets Death Leaper, his Wolf Guard eye the mawloc hungrily. The Blood Claws reverse their Rhino north, away from the genestealers and closer to more heavily armoured support. The Stormfang banks to the West and slows but cannot bring its weapons to bear on anything. The Wolf Lord challenges Deathleaper, and thanks to his warlord trait Saga of the Beast Slayer rerolled his horrible initial roll to destroy the beast while only taking a single wound. The Wolf Guard dispatch the mawloc, losing a single terminator in return. The wheel turns again - now the hunters are the hunted. The First Curse, and the neophyte squad move off the southern and eastern board edges respectively, back into the shadows to strike again later. The Patriarch appears in cover next to the central chapel, near Objective 3. Meanwhile, the scout sentinel on Objective 1 wrecks the Blood Claw's rhino with his lascannon. The Wolf Lord and the Blood Claws board the Landraider, which moves back into the center next to Objective 3 to threaten the Patriarch next turn, leaving the Wolf Guard Terminators near Objective 5. The Stormfang flies off the western table edge. The First Curse and the acolytes return to the field from the northern table edge, the acolytes to secure Objective 4, the genestealers boil out of the forest to assault the Wolf Guard Terminators with the Patriarch's assistance. The battle is fierce, and the terminators' armour serves well but still three of these heroes fall leaving a single warrior armed with a storm shield and thunder hammer still swinging surrounded by horror. As the last of his guard is pulled down and dismembered by razor sharp talons, the Wolf Lord orders the Landraider to speed back south onto Objective 6, where he leaps out of the vehicle into assault range of a lictor who has been hiding behind the ruins near Objective 2. Meanwhile, the Stormfang doesn't reappear from reserves. The Landraider's multi-melta explodes the scout sentinal, and the Wolf Lord dispatches the lictor and claims Objective 2. I picked up 3 VP's this turn so really hope this turn is the last....And the game continues to turn 7! With three units remaining (counting the HQ) little happens. The genestealers spread out near objective 5 and the neophytes hunker down on Objective 4. The Patriarch joins the First Curse just in case the Stormfang returns. The Landraider grinds forwards and the Blood Claws get out to secure Objective 1 near the wreck of the scout sentinel. The Stormfang finally returns, and screams up the western flank and targets the acolytes, destroying 6 and pushing them off the objective, but it is a minor victory too late for the battle which is over. And the final Tactical Objectives are revealed - Genestealer Cult: 10 Space Wolves 10 DRAW! This was a really tough battle, and the hidden tactical objectives of the Maelstrom scenario really added to the tension as you couldn't relax the pressure. I thought I was going to be tabled after the Genestealer's turn 2 - the Cult Ambush rule, combined with the Patriarch's Ambush Leader warlord trait was really powerful and flexible. The Genestealers and the Tyranids performed well - each alien unit did what it was designed for, and the First Curse are brutal. The neophyte cavalcade not so much, although I got some really lucky rolls to take out so much of them on Turn 2. The Ironwolves formation was a bit average - it felt very like a 5th ed list without the rune priest. that being said, all those free multi-meltas, extra armour and dozer blades were nifty. But the list lacked enough hammer units, and each unit was small enough that I didn't have staying power. I kept wanting some thunderwolf cavalry, although I'm sure they would have been mawloc'ed to death early. Back to me - All credit to my opponent - he played a new list and codex really well, and had me on the defensive early. I'm sure my friend will be rejigging his list over the coming weeks, but for a first outing of a codex I would say this is a really fun and strong army to play against. Hope you enjoy the battle report! That Cult list was a tough one to hide from. With Purestrain and Mawlocs being able to challenge from any hidden corner. Thanks for the write-up.